I could start to like these WWE Heritage releases. For 2015, The Heritage release was using the 1985 style baseball release. This trend continues on to 2016, as this Topps trading card set uses the style from the 1986 baseball release. It differs from the yearly baseball Heritage set as it is targeting 30 years ago, rather than 50. That’s interesting when the flagship sets for WWE and Baseball use the same current style for the main yearly release. This set draws heavily from the 1986 Topps baseball set, for the base card design, as well as insert sets featuring NWO and WCW All Star Cards, Record Breaks, Turn Back the Clock card, and an All Star inspired patch card. The set itself features stars from the WWF years, WCW, NWO, WWE, and up through NXT. The base set contains 110 cards, but the various inserts are very collectable as well. The hobby box advertises 24 packs of 9 cards, including 2 hits per box. 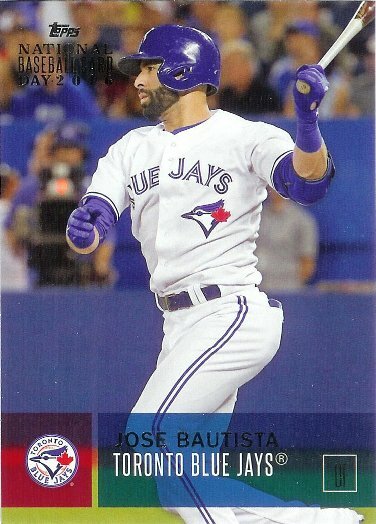 Topps is starting to get in to the business of National Baseball Card day. Six card packs were given away at hobby stores, as well as a bonus Kris Bryant card with a certain purchase. The full set consists of 49 cards, but the packs also include random autographs as well. There’s not much too it, but for free, you can’t really complain. It’s a bit of a different design, and seems a little out of character for Topps. It’s a nice change of pace, though.